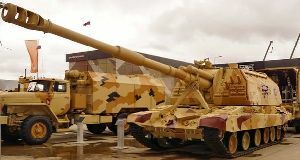 The 152 mm 2S19 MSTA-S self-propelled howitzer is designed to defeat unsheltered and covered manpower, weapons and materiel to division level. 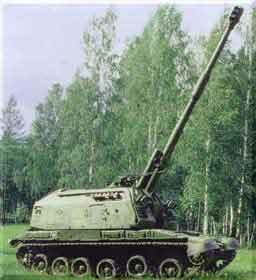 MSTA-S entered service with the Russian Army in 1989. 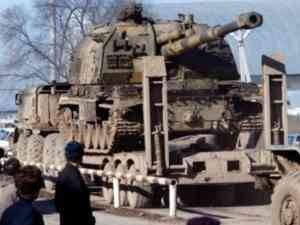 MSTA-S comprises a turret mounted on a tracked armoured chassis which has been based on elements of the T-72 and T-80 main battle tanks. It is manufactured by Uraltransmash of Ekaterinberg, Russia. 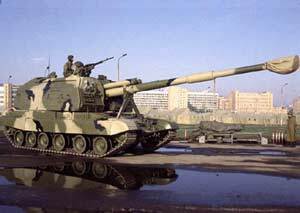 Uraltransmash also produce a towed version, called MSTA- B. ARMAMENT The howitzer's 152 mm gun is the 2A64, manufactured by the Barrikady State Production Association, Volgograd, Russia, which produces a variety of large-caliber artillery armament for the Russian Army and Navy. Elevation is from +68 to -3 degrees with 360 degree traverse. 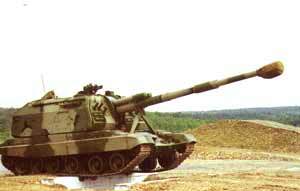 There is also a 12.7 mm anti-aircraft machine gun that is remotely controlled by the commander. 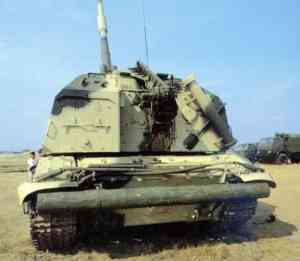 Three smoke grenade dischargers are mounted on each side of the turret. 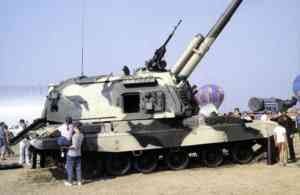 50 rounds of ammunition for the howitzer gun are carried onboard and 300 cartridges for the machine gun. AMMUNITION MSTA-S fires a variety of ammunition - HE-FRAG (high explosive fragmentation), HE-FRAG with base gas bleed, cluster projectiles with fragmentation submunitions and the Krasnopol laser-guided 152 mm projectile. 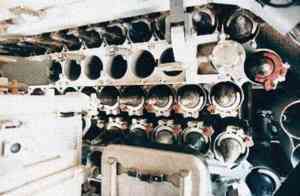 It can also fire the 3RB30 jammer carrying projectiles which set up radio interference to disrupt enemy communications. 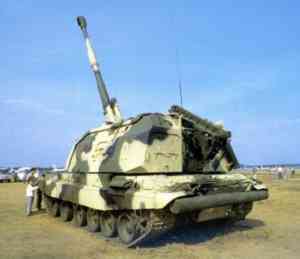 These have a range of 22 km and can jam frequencies between 1.5 to 120 MHz to a radius of 700 m.
KRASNOPOL LASER-GUIDED PROJECTILE The Krasnopol projectile has been developed by the KBP Instrument Making Design Bureau, Tula, and is designed to defeat armored vehicles and weapon emplacements. It has inertial mid-course guidance and semi-active laser homing. The laser seeker is produced by LOMO of St Petersburg. To protect the optics of the homing head, the nose unit separates in flight. The projectile comes in two sections - projectile unit (warhead, booster and fin assembly) and control section (autopilot, homing head and nose unit), to enable fitting in standard ammunition rack. The projectile has a range of 3 to 20 km, and can hit a target by the first shot without registration. 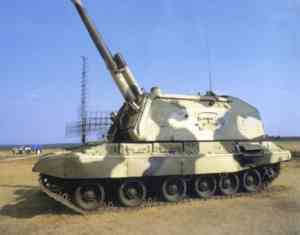 Krasnopol is designated by the 1D15 (1D22) laser designator and has a 1A35 shot synchronization system. Ammunition and gun loading, laying and retargeting are highly automated, allowing maximum firing rate of 8 rounds per minute with onboard rounds and 6-7 rounds per minute with rounds from the ground. 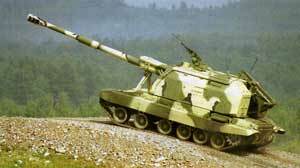 A battery of 8 MSTA-S can deliver 3 tons of projectiles on a target in one minute and move on to the next firing point before reaction firing. The laying control system is co-ordinated with the fire control vehicle. All the onboard ammunition is stored in the turret and a mobile reloading tray allows loading and firing at all angles of laying without needing the gun to return to the loading position. A charge loading mechanism is also provided. 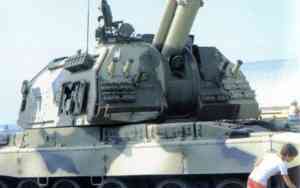 The system provides automatic gun loading for projectiles and semi-automatic loading for charges. The design of the ammunition rack allows different types of projectiles to be stored in the same rack. 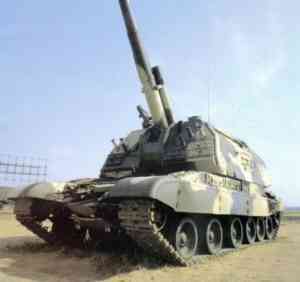 The automatic loading mechanism can select the type of ammunition and control the loading and the number of rounds. 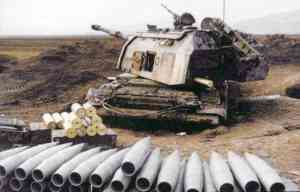 Used ammunition cases are ejected automatically to reduce the build-up of waste gases. 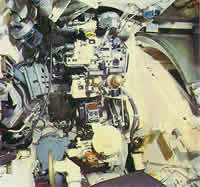 The gun housing is tightly sealed to provide protection for the crew against recoiling gun parts and powder fumes. 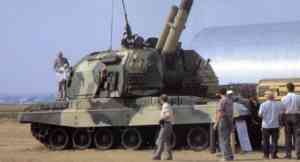 There are separate conveyers in the rear of the turret that allow the loading of ground ammunition. Before the howitzer starts off, the projectile conveyer is folded and fixed on the turret and the charge conveyer is folded inside the turret. The automatic loading and laying system has manual back-up for firing in the event of a power failure. All the gunner has to do is hold the panoramic sight on the laying point. 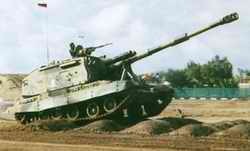 The commander also has control of the firing and laying equipment. 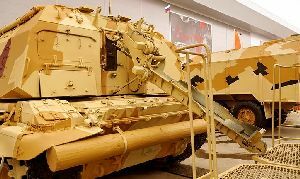 The 2S19 is based on a full tracked MBT chassis with the driver at the front, fully enclosed turret in the center and powerpack at the rear and in many respects is similar to the French 155-mm GCT self-propelled artillery system based on an AMX-30 MBT chassis. The hull and turret is of all-welded steel armor construction which provides protection from small arms fire, shell splinters and mines. 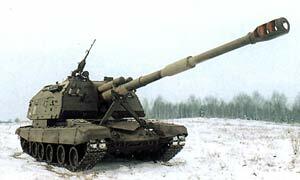 The 2S19 self-propelled artillery system is based on the chassis of the T-80 MBT but with automotive components of the T-72 MBT as the 2S19 has a distinct exhaust outlet on the left side that is not on the T-80 which is powered by a gas-turbine engine. 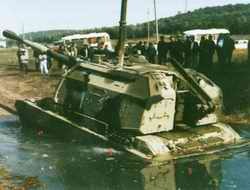 Mounted under the nose of the vehicle, in a similar manner to that of the T-72/T-80 MBT's, is a dozer blade that can be used to prepare fire positions or clear obstacles. The suspension is of the torsion bar type with six road wheels, idler at the front, drive sprocket at the rear and track-return rollers with the upper part of the track being covered by a skirt. The vehicle commander is seated on the right and operates the roof-mounted 12.7-mm machine gun that can be operated by remote-control and the searchlight. 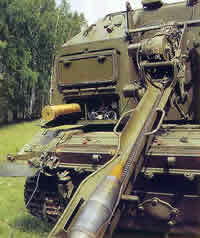 The 12.7-mm machine gun can be used to engage both ground and air targets. 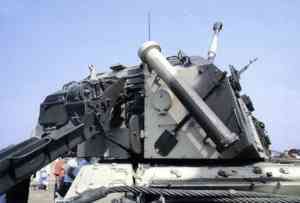 Mounted externally on the right side of the turret are boxes of 12.7-mm machine gun ammunition for ready use. 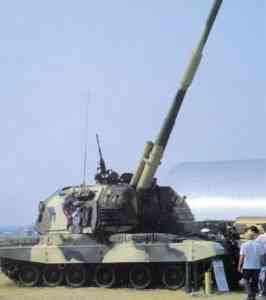 Main armament comprises a long-barreled 152-mm gun fitted with a fume extractor and a muzzle brake. When the 2S19 is traveling the ordnance is held in position by a traveling lock mounted on the glacis plate. 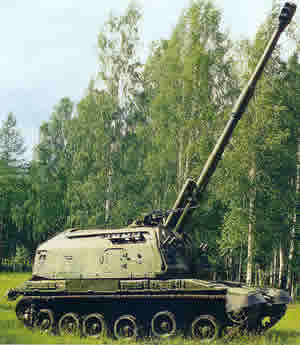 The 152-mm gun fires an HE-FRAG (high explosive fragmentation) projectile to a maximum range of 24700 m, although using an extended-range projectile its range is probably 36000 m. Other types of projectile can also be fired including illuminating, incendiary, smoke and tactical nuclear. Automation of the loading process enables a maximum rate of fire of 8 rounds/min to be achieved using onboard ammunition and 6 to 7 rounds/min using projectiles and charges from the ground. 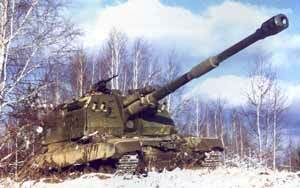 This selects and then places the fused projectile into the breech with the charges being loaded semi-automatically. In addition to selecting the projectile from the magazine, the automatic loading mechanism controls the number of rounds to be fired and has built-in test equipment. Laying in elevation is automatic with laying in traverse being semi-automatic. A total of 50 projectiles and charges is carried. 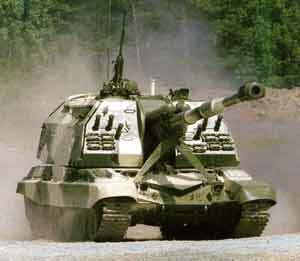 Spades are not required on the 2S19 as it is very stable when in the firing position. 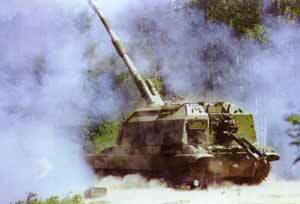 If required the 2S19 can be reloaded through the turret rear while the system is firing. This enables the system to move off to its next fire position with a full load of ammunition on board. 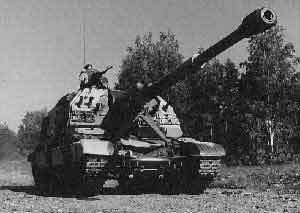 Three smoke dischargers are mounted either side of the turret. A 16 kW autonomous gas-turbine auxiliary power unit (APU) is provided in the turret and this provides power within 30 to 60 seconds of being switched on. This allows the system to be fully operational at temperatures ranging from -50 to +50°C with the main diesel engine being switched off to conserve fuel supplies. Standard equipment includes an NBC system and night vision equipment for the driver.